Last night, I had yet another bowl of raspberries sitting in the kitchen, but I decided to change things up a bit and open a can of lychee. Lychee is native to China, but my family eats regularly. It's similar to another fruit called longan that is readily found in the Philippines, which is probably why my family enjoys it. You can't buy it fresh where I live, but you can usually find it in Asian supermarkets in the city. When it grows on the tree, it is covered by a reddish-pink, bumpy shell. By the time it makes it to overseas supermarkets, the shell is brown. To open them, you simply squeeze the shell until it splits, and then you peel the shell off. The fruit is white, fleshy and sticky. Inside is a shiny, black pit, the shape of an olive. 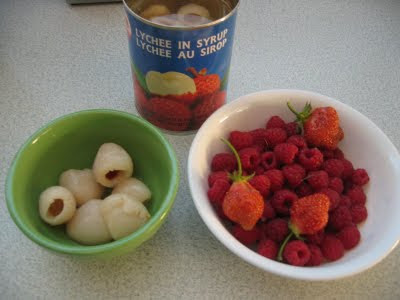 I had lychee and raspberries for dessert, but they didn't go well together. Too sweet and too tart, but it still worthwhile!